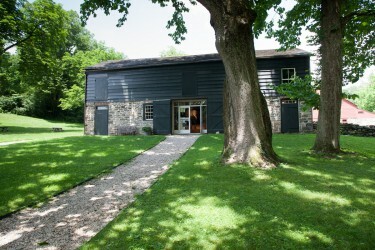 Construction of the Carriage Barn began in June 1801 and was completed in 1802. At that point, it consisted only of the part with the stone and mortar ground story. Double doors were put on the south wall to admit carriages; another set of doors on the north wall opened onto the courtyard, so the horses could be taken to stables in the lower story of the coachman’s house across the way. The large, central area of the carriage barn was meant for storing vehicles. On the sides of this area were much narrower spaces whose original purpose is not documented, but which likely contained more stables for horses, and storage areas for tack and other supplies. The building underwent repairs and alterations as the years went on. Sometime by 1908, the most extensive change was made when a large wooden shed was built onto the north side. With its wide sliding doors and concrete floor, it was constructed to garage the automobiles of Arthur and Eleanor Jay Iselin. Today the Carriage Barn serves as our Education & Visitor Center featuring interactive exhibits, a video and a Discovery Center.